Most major hotel chains have locations in the UAE. When it comes to hotels, there’s luxury and then there’s the UAE standard of luxury. Visitors can opt to experience the nation’s over-the-top accommodation, with many of the hotels offering gaudy décor, decadent spas and five-star amenities. The Burj al-Arab, the Emirates Palace and the Al Maha Desert Resort & Spa are some of the more luxurious places to stay, but there always seems to be another opulent property opening, including the Armani hotel in the Burj Khalifa, the tallest building in the world. If you’d rather pass up Ali Baba’s grotto for understated class try the grand Al Qasr, for its tasteful Arabic flavor (think: Middle Eastern patterns and antique fixtures). The grand lobby smells of sweet rose petals, which are scattered into a water feature in the centre, while rooms look out onto the sparkling Gulf waters. Emirates Palace, on the other hand, is all about decadence. 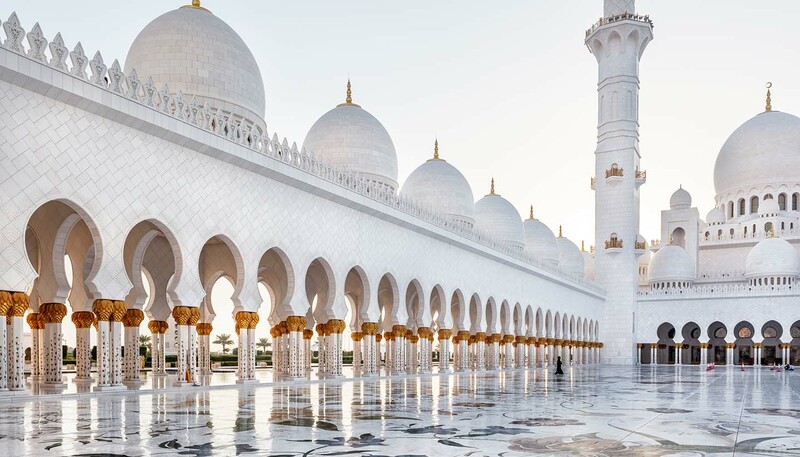 Live like Arab royalty in the AED11.2 billion property in a room slathered with gold and marble fittings, while being waited on hand and foot. One thing’s for sure, hotels in the UAE are creative. Right here in the desert you can bed up in a winter-themed hotel, with rooms decorated chalet-style and look out onto a ski slope with penguins. Kempinski Mall of the Emirates is dotted with windows looking onto Ski Dubai inside Mall of the Emirates, meaning you’ll never miss colder climes. Dubai is also set to unveil the Water Discus Hotel. Not only will it look like a space ship hovering in the sky, it will have rooms 10m (33ft) beneath the water's surface. Hotel rates tend to be cheaper in the sweltering summer months, when many of the UAE’s residents escape to cooler climes. Smaller, non-descript, budget hotels do exist, concentrated around Deira and Bur Dubai in Dubai. There are a number of no-frills, inexpensive chain hotels such as Ibis and Holiday Inn, plus the new Canadian chain City Max, which is keeping prices competitive. The City Max Barsha branch has a lively American-themed rock bar on the ground floor and a very reasonably priced brunch at weekends. It is possible to camp in most rural areas. However, there are no official campsites in the UAE, meaning there are no European-style facilities, but visitors are allowed to pitch their tents in most wadis and desert areas. Try Wadi Hatta, the Dubai Desert Conservation Reserve or if you're an experience camper, venture out into the desert off the road to Dhaid. There are very few hostels in this Gulf nation; however, the United Arab Emirates Youth Hostel Association (part of the Hostelling International network) runs three hostels in Dubai, one hostel each in Sharjah and Fujairah. Check the prices before you book, as you may find the locations are actually better, and rooms cheaper, in a budget hotel.